Frilled veils final thesis is online! The Archeological Museum in Haarlem, The Netherlands, hosts an exhibition dedicated to the memory of Olaf Goubitz. He was a Dutch archeologist who specialized in medieval leatherwork, such as shoes and purses. The exhibition is small and shows a number of original shoes, pouches and scabbards, and some of Goubitz' replica. It is prolonged till 10th october 2010. -I went to the exhibition with the Deventer Burgerscap. Bertus wrote about it here. Wow, what an opportunity. Thanks for sharing the photo and the link to the other blog that had more pictures. Wow! I just love it! Is thare any opportunity that pictures of items shown will appear in internet? I would love to see the purses - this is my very best interest. 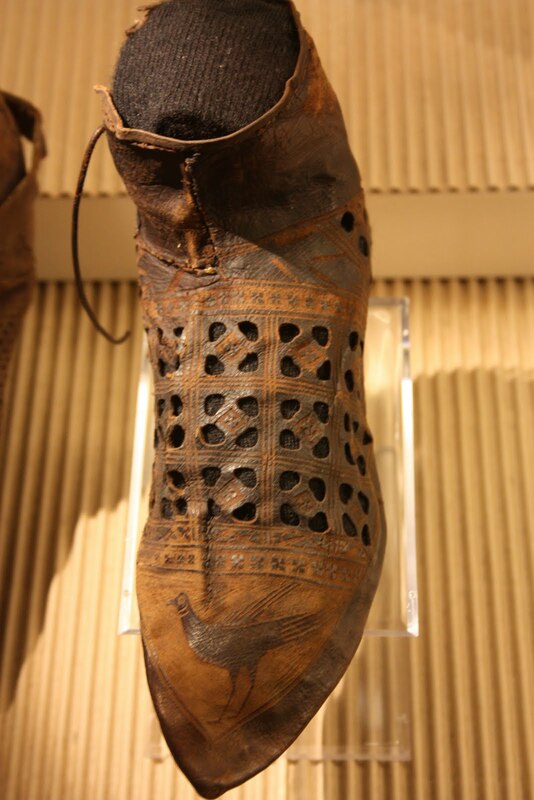 and people say that medieval crafters only did "basic" stuff... lol... that is an amazing shoe!! !